About this object Jonathan Dayton of New Jersey served two terms as Speaker of the House before being elected to serve in the Senate. International anxieties blended with domestic politics as the Jay Treaty controversy continued to reverberate in the 4th Congress (1795–1797). The Senate approved the treaty as apprehensive Americans divided over whether Great Britain had gotten the better bargain. A hostile House sought to undercut the agreement by legislating around it, but ultimately provided the funding needed to implement the treaty. 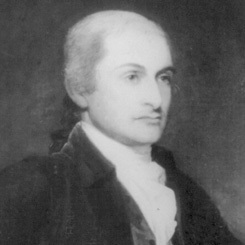 The election of Albert Gallatin of Pennsylvania finally provided the House the financial expertise to the administration’s policies. President George Washington posed for artist Gilbert Stuart for the famous Lansdowne portrait, the basis for two of the first chief executive’s portraits in the U.S. Capitol.